WHAT I SMELL: Elephant & Roses opens softly with a wonderfully herbal thyme that is sweetened so slightly with osmanthus. The perfume is light, soft and reassuring and unique in that it doesn’t start off with an oft seen bergamot or citrus blast. After a few minutes, a warmth from the amber develops and it helps to push-off the herbal and floral notes, lifting them up from the ground and sending them flying towards the sky. The rose begins to come towards the center, but it’s a lightly earthy rose that is anything but sweet and it’s very tender in its existence. As tender as the perfume is, an anamalic note begins to appear to give the perfume some wonderful depth and a bit more of an exotic feel…which was already exotic from the beginning. A vetiver and musk note brings the perfume to a more linear base, but helps to keep the perfume, soft, comforting and lightly radiant. A late afternoon, sitting at my desk, exercising to recreate an elephant smell, while writing my perfume formulae I had a kind of a vision, which merged the elephant’s image, its smell and a large field of roses, of an intense colour, almost fuchsia. Within this vision the elephants were running and, trampling on the roses, were dispersing a scent of flowers, mixed together with the strong smell of their bodies. Slowly – while I was weighing and smelling my formula – after trying it on my skin I realised that it was mine. I used the Turkish rose: this fragrance is derived from the blending of two different formulae, using the so called “dans le tiroir” method, by which I merged animal notes with skin and floral ones. 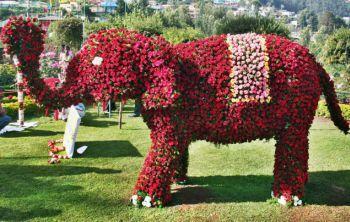 Name’s origin : The elephant comes from a remembrance of Indian and African colonies, and the rose is the British rose. An encounter between an elephant and the roses has got some British sense of humour. There is an assonance with London district Elephant & Castle. WHAT IT SMELLS LIKE TO ME: I can’t argue with the perfume’s name and inspiration, it makes for a lovely visual. BOTTOM LINE: I am a big fan of Maria Candida Gentile perfumes. They are all distinctively hers and this perfume is no exception. 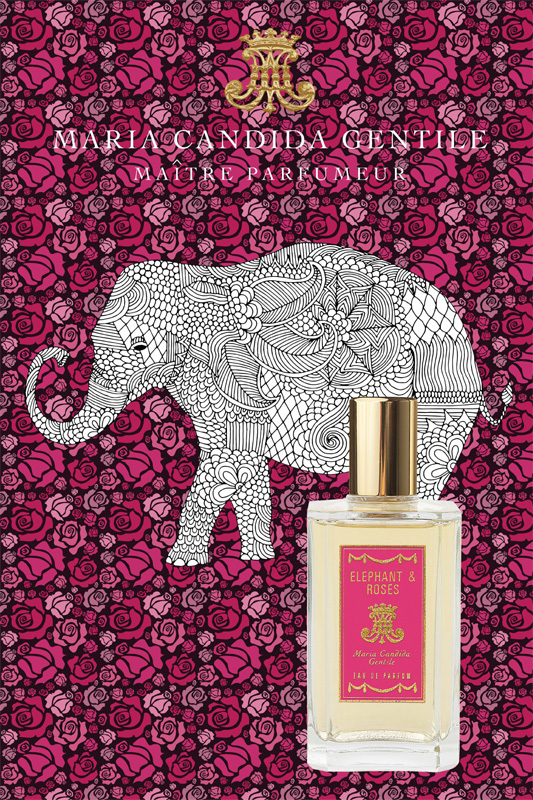 Elephant & Roses is less of a “rose” perfume than and herbal floral arrangement and would be a good rose perfume for those who don’t want to smell like a fragrant bouquet of sweet roses. Categories: Maria Candida Gentile | Tags: 3 bones, aromatic, eau de parfum, EDP, Elephant & Roses, fragrance, Maria Candida Gentile, New Release, parfum, Perfume, Perfume Review, review, unisex | Permalink.